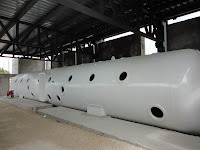 The Michigan State University (MSU) College of Osteopathic Medicine and Institute for International Health has partnered with the Yucatan Department of Health to provide hyperbaric oxygen therapy at the new University Hospital Augustin O'Horan in Merida, Mexico. The triple-lock, 23-person multiplace chamber, measuring 53 feet by 10 feet, is the first of its kind in Latin America, according to the MSU news release. The center will focus on "trauma, burns, stroke, wound healing, palliative care, toxicology, and osteopathic medicine." We could guess, but would like to know for sure, who manufactured this impressive chamber.